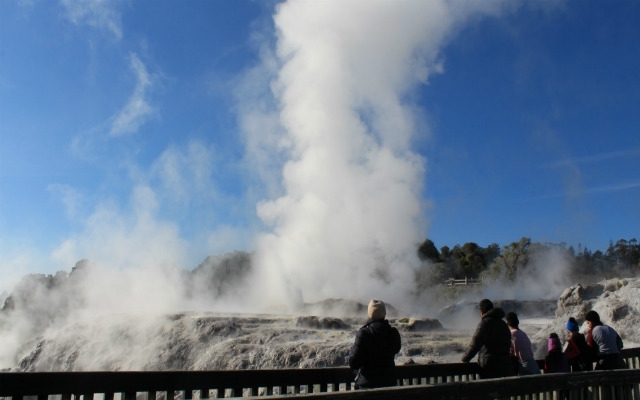 We take a look at a trio of the top geysers in the Rotorua region. 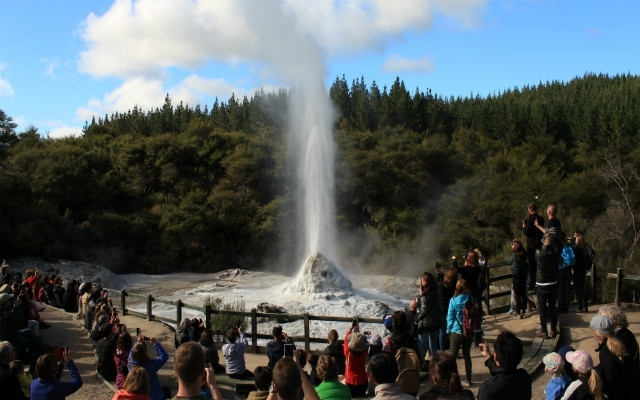 Colossal water spouts and the chiselled summit of one of New Zealand's most active volcanic cones await anyone eager to squeeze every last boiling drop from their trip to the Rotorua Geysers. A land of fire and fumes, of spurting volcanic craters and smoke-belching fumaroles, the great Taupo Volcanic Zone of New Zealand's North Island remains one of the most fascinating natural regions in the country. Every year visitors flock to this old Maori land to see the spurting jets of boiling water that the New Zealand natives hold in sacred accord. They come to gawp upwards at some of the largest volcanic phenomena in the Southern Hemisphere, to understand the curious geological past that's given rise to the effervescent Rotorua Geysers, and delve into the mystical folklore that now surrounds the subterranean vents, the smoking pools and mud pits. No tour of Rotorua's geysers could possibly be complete without at least a glimpse of this mighty fountain of frothing steam and water. 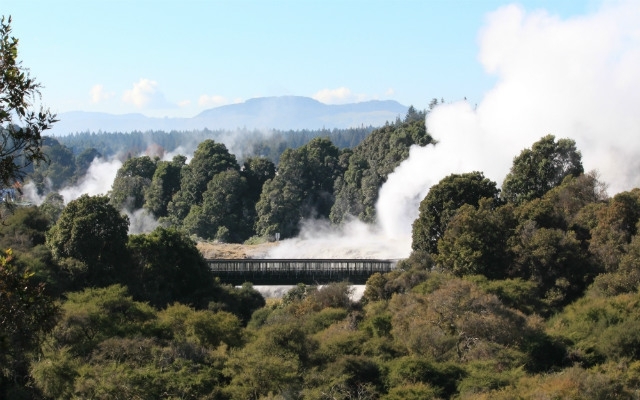 Nestled between the black stone ridges and calcite-stained rocks of the Whakarewarewa Thermal Valley on the southern fringes of Rotorua town itself, Pohotu hails in as the single largest geyser in the entire Southern Hemisphere. And boy does it live up to the superlative! Erupting around 20 times each day on average, it's capable of hitting whopping heights of up to 40 meters. What's more, single eruptions have been known to last for days on end, with the record currently at 250 days for a single burst - no wonder the Maori name translates to "big splash!" But Pohotu Geyser isn’t just a breathtaking wonder of New Zealand nature; it's also a site steeped in Maori folklore and tradition. In fact, the geothermal valley of Whakarewarewa in Te Puia is now joined at the hip with the fascinating Maori Arts and Crafts Institute of Rotorua. Here, between sessions on intricate wood whittling and bone carving, the locals reveal tales of how the great geysers of Rotorua were forged by the nature deities of the waiata (old religious songs): Hoata and Te Pupu – the two Goddesses of Fire. 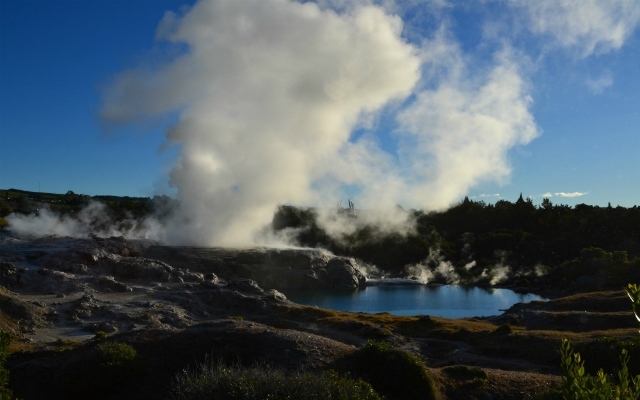 The geyser can also be seen from the neighbouring attraction of Whakarewarewa Thermal Village. Along with experiencing a 'Maori Village', hot pools and cultural performances, visitors cans see the geysers of Pohutu and Prince of Wales ‘Feathers’ from their viewing platforms. 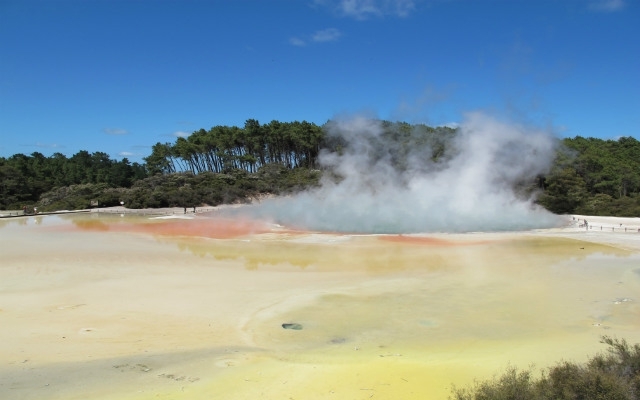 Lady Knox is another of the spouting Rotorua Geysers popular with those eager to see the bubbling pools and sulphur-spewing wonders of the Taupo Volcanic Zone. Situated just half an hour's drive south out of the lakeside city itself, Lady Knox can be found babbling above the silicate protrusions and multi-coloured hot pools of Wai-O-Tapu. Visitors flock in the morning for the daily show at 10.15am. This is introduced by a knowledgeable guide who reveals the scientific background of the thermal region before initiating an eruption with a chemical catalyst. The spectacle sees an eruption spouting almost 20 meters into the air, issuing plumes of hot steam and wisps of vapour as it goes. Afterwards, it’s onto exploring Wai-O-Tapu Geothermal for the budding volcanologist. Take the winding pathway around Champagne Pool, the Devil’s Bath, bubbling mud pools and the veritable kaleidoscope of ochres, greens and turquoise blues that blooms amidst the steaming hot springs here. (And that’s not even mentioning the on-site Visitor Center, where the terraced Geyser Café awaits after a morning of volcano spotting!). Daily eruption shows take place at 10.15am. Extra travel time is advised during the busy summer months. Smoking and steaming and issuing plumes of sulphuric clouds into the air above the Bay of Plenty since time immemorial, White Island pokes its way atop the cobalt-blue Pacific waters just a stone's throw from the coast of Whakatane. It's actually the tip of an active stratovolcano, which soars a whopping 1,600 meters from the seabed below, and comes carved with countless magma channels, ancient grykes, and deep caldera ridges. 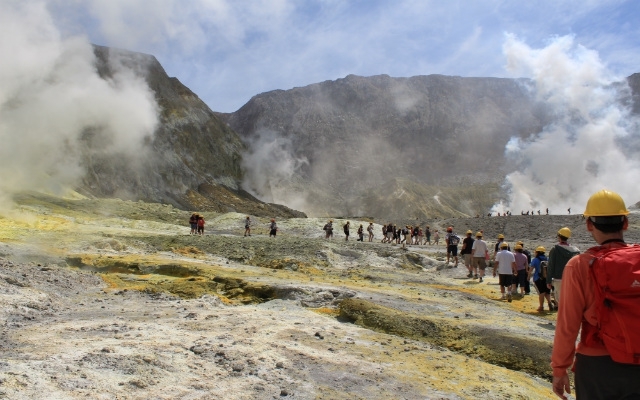 Tours to White Island take the form of cruises or fly-in visits, which typically depart from Whakatane less than an hour’s drive from Rotorua itself. However, scenic flights from Rotorua offer a convenient way to explore New Zealand’s most active volcanic attraction. Visitors first enjoy dramatic panoramas of the volcanic cone as they swivel around the summit by helicopter. Then it's onto the ground, where walking guides reveal the otherworldly patchwork of sunflower-yellow sulphur build-up, the smoke-spouting fumaroles and the countless hot streams that flow over the land. Fly-in tours departing from Rotorua typically take three hours' roundtrip. Prices start at around $865 for adults and $649 for children. Boat cruises to the island typically take a couple of hours and include dolphin spotting. Prices are around $200 per adult.